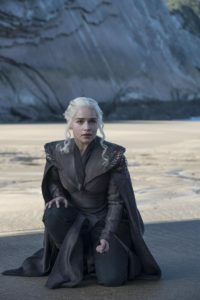 Game of Thrones is back with a lavish premiere where we catch up with the major players and the pieces are set in motion for a truly epic season. There’s righteous vengeance, a long overdue homecoming, and many quiet character-building moments. The Starks were the stars of the show once more as the surviving siblings spread across Westeros, exerting their influence in different ways. We get a quick glimpse of Bran (and an exhausted Meera Reed) arriving at the Wall to warn them of the coming storm. Dolorous Edd hesitates at first but Bran uses his powers to convince him. Meanwhile, in Winterfell, Jon Snow is busy rallying the North against the White Walkers, starting a campaign that will (very progressively) include training all able-bodied men and WOMEN of the North. Lady Lyanna Mormont gets some good quotes in. Women hold so much power in Game of Thrones and that’s a good sign for the direction the show will take in its last dozen episodes. However, trouble is brewing as Jon and Sansa clash in leadership styles (with creepy Littlefinger enjoying the tension). It’s great how both of them have good reasons for their decisions as well as the experience to back up their proposals. But Jon would really do well to listen to Sansa, who’s learned how to expertly play the game from all her experiences. He’s a good military strategist and he has a big-picture perspective, but he cannot afford to ignore the complicated human political elements still at play in Westeros. The best leadership strategy would be a balance of Jon’s military instincts and Sansa’s cunning and perception. Here’s hoping they both learn to compromise in the future. Back in King’s Landing, Cersei Lannister gives a pretty good recap of her allies and enemies. It’s an exposition-heavy sequence but still artfully done with an elaborate map of Westeros painted on the floor. Jaime looks doubtful of his twin sister but remains at her side for now. She’s turned to the last ally she has left, Euron Greyjoy, though he might have an agenda of his own. 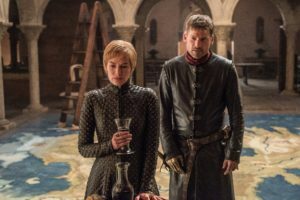 These are tricky times to be Lannisters but Cersei is not one to be underestimated, considering the fates of her other enemies so far. The episode also began with a crowd-pleasing massacre, and with Arya Stark playing the angel of vengeance on those who tormented her family. Not content with feeding Walder Frey a special kind of pie last season, she reminds all the male Freys that the North remembers and poisons an entire family of horrible people. While one must not condone mass murder, in Game of Thrones, one can’t help but feel a certain satisfaction at terrible people getting their due. 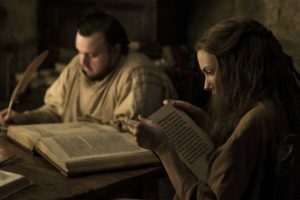 But beyond the spectacle of dragons and epic battles, Game of Thrones also succeeds when it focuses on small moments with major characters and quiet but significant moments. The way the episode ended, with Dany’s long overdue return to her family’s seat in Westeros, was all the more powerful because it was very understated. The entire scene was shot in almost complete silence and we felt even her awe as she finally reached the place she had been dreaming about for years, and took the seat that she feels she was destined to take. 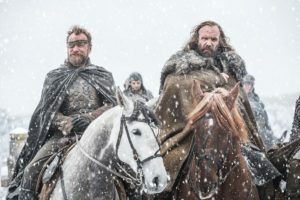 Another set of quiet scenes was between grumpy old Sandor Clegane as he travelled with Thoros of Myr and Beric Dondarrion. He found himself back at the farm where he and Arya stayed in season 4 and where he stole the farmer’s money. He knows now that it was probably this act that led the poor family to starve to death, and one can sense the weight of the guilt on his tired features. He proves more reflective than he gets credit for and even tries to do a good thing by burying the bodies and attempting to say a prayer for them. And it turns out, irony upon irony, he can read the truth in the flames. Sandor knows what’s up. The episode also featured two guest stars whose roles varied in significance. First, there was the hyped-up cameo of Ed Sheeran as a Lannister soldier Arya hears singing in the forest with his fellow soldiers. Turns out, Sheeran doesn’t do much with his little screen time; after singing, he simply nods along with the others as they recount their stories and remind Arya that even Lannister soldiers are human too. 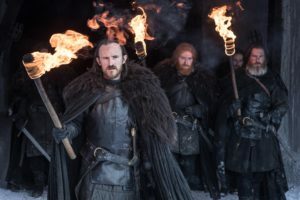 The more notable guest star was Jim Broadbent as an archmaester who gives Sam a lesson about Westeros history and who seems to be the only one at the Citadel willing to take Sam’s warnings about the White Walkers seriously. Poor Sam is not living the dream as he has to endure a seemingly endless cycle of what one reviewer calls « poop and soup ». But in the end, he learns about a whole mountain of dragonglass, the best weapon against the evil, frozen dead. And guess who just arrived in Dragonstone ? Winter is here. And everything is about to change.